We’d love your help. Let us know what’s wrong with this preview of Tangled Up in Trouble by Olivia Hardin. To ask other readers questions about Tangled Up in Trouble, please sign up. Lynlee Lincoln is such a fun character to read about! She’s sassy, tough, magical, and someone that has a big heart, a heart that can get her into trouble sometimes. Lynlee is a witch trying to balance her time between her love and helping out her supernatural clients get out of sticky situations. It’s always fun seeing how her clients get into trouble, some of them can be quite funny. But the creatures Mrs. Hardin brings to the pages make me smile the most because they’re creatures that aren’t normal ones we get to read a lot about, they’re usually more the secondary types. So being able to return to this world again put a smile on my face. Tangled Up in Trouble, just like the first in the series Trolling for Trouble, sucked me in and wouldn’t let me go. All I wanted to do was read this charming novella. It hypnotizes you with its colorful and magical world. With how it ended you’ll be hoping for a third one to be written, you’ll be dying to know what happens next with this cast of characters. And boy is it a cast of characters! You got a witch, the sandman, a nymph, a werecat, a werewolf/vampire, a goblin, and cupid! Yes cupid and more! Seems like a lot huh? Trust me, all these stories blend and flow so well into Lynlee’s life and you’ll be dying for more when you finish! Mrs. Hardin has done an absolutely wonderful job. She’s created such a fun world to escape into! I love how Lynlee is proud to be a witch and one that’s trying to balance her two lives (A bit refreshing from Young Adult). And it just got a little bit harder as she’s back with an old flame who happens to have two kids of his own. That definitely can damper the romance in certain situations, like how you get all hot and heavy (with the kids fast asleep in their beds) on the couch when all of a sudden his son walks into the room making him drop you on the floor haha. Many laugh out loud moments for sure! But at the same time there are heart wrenching moments when Lynlee starts seconding guessing and afraid she might scare her love away again. Olivia Hardin has a way of writing that immediately pulls you into the story, keeping you engaged for the whole ride, and immediately wanting more when its over. If I went on roller-coasters, I imagine that's how they'd be. I don't go on roller-coasters, because I was born feet first and meant to stay that way, so maybe I should avoid roller-coaster metaphors. The point is, Hardin's books make for a super fun ride! In Tangled up in Trouble, Lynlee Lincoln picks up slightly after where she left of Olivia Hardin has a way of writing that immediately pulls you into the story, keeping you engaged for the whole ride, and immediately wanting more when its over. If I went on roller-coasters, I imagine that's how they'd be. I don't go on roller-coasters, because I was born feet first and meant to stay that way, so maybe I should avoid roller-coaster metaphors. The point is, Hardin's books make for a super fun ride! 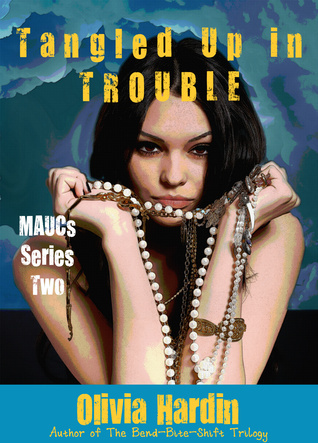 In Tangled up in Trouble, Lynlee Lincoln picks up slightly after where she left off in Trolling for Trouble. I suggest reading the short first book before Tangled Up in Trouble, because it gives you some vital background info. It's a very quick read. Anyway, in the second book, Lynlee is enjoying her reconnection with her long-lost love, Beck. Now, Beck and Lynlee have a difficult relationship. Beck actually once left Lynlee because he couldn't deal with the fact that she's a witch. Nice, right? While I wanted to scream at Lynlee and say that any guy who can't accept a very fundamental part of her doesn't deserve her, it's hard to argue with someone when they're in love. To make things even more awkward, Beck has two kids. One of which is a nymph, and Lynlee's charge. So basically, Lynlee is just trying to settle into her new role as girlfriend and, well, not really a mother figure, but sort of, with two children. That would be enough for any witch, but now someone is stalking other supernatural creatures, including her charges, to collect ingredients for a potion that no one really knows what it will do. Add to that her regular job of cleaning up the messes that other magical creatures leave behind when they oh, say, decide to try to let their human friends in on the fact that they're a satyress, and you have one busy witch! While Tangled Up in Trouble is slightly longer than the first book, it's still a quick read. It's perfect for a short afternoon at the pool or a long wait in a doctor's office. I read it in about an hour without breaks. If you're looking for a fun read filled with magic and romance, check out Tangled up in Trouble! Lynlee is a neutralizer. Think of her as someone like J from Men in Black, only no aliens. She a witch and her job is to keep the other MAUCs (Magical and Undead Creatures) from exposing themselves to the world. It's inevitable that some humans will find out that there are such things as witches, vampires, goblins, nymphs, etc. but most of the time they will convince themselves that they were just seeing things. In those situations where there is no denying what they saw, Lynlee steps in to clea Lynlee is a neutralizer. Think of her as someone like J from Men in Black, only no aliens. She a witch and her job is to keep the other MAUCs (Magical and Undead Creatures) from exposing themselves to the world. It's inevitable that some humans will find out that there are such things as witches, vampires, goblins, nymphs, etc. but most of the time they will convince themselves that they were just seeing things. In those situations where there is no denying what they saw, Lynlee steps in to clean up the mess. She has several MAUCs she is responsible for cleaning up after, including the daughter of the human man she is dating. That's right, she's dating a human. He knows about her world from having dated her in the past, but now he is back in her life after Lynlee saved his nymph daughter's life. He had no idea she was a nymph which is actually a big part of the reason his daughter was so deathly sick. Now Lynlee is trying to track down a dark witch while trying to maintain her relationship with Beck. She's also learning a little bit about what it is like to try to be a parent and a mother. Her instincts are there telling her what to do, but they aren't always right on track. It might be because she has so much other stuff to think about with trying to keep the dark witch from hurting one of her charges. Things get really tricky when her personal life becomes a part of the case. Will she find the dark witch before someone gets hurt or killed? Will she give up on her relationship because she feels that being with a human is doomed to fail? Lynlee is still attempting to establish herself in a relationship with Beck when she hears from her old mentor, Tig. Beck, the handsome flame from her past, has two kids that One of the things I like about this series is it kind of portrays love in the real world, err paranormal world (close enough). It's about established adults that have a past behind them, and the romance isn't all hunky-dory new and fresh. It's something that takes work, as I imagine most romances in the real-world would be. Olivia Hardin has done it again! Tangled Up In Trouble is a little bit of both things that a girl loves….magic and romance. I love Lynlee’s character because she is a clean up girl for the MUAC. I think that this would be something that I would do if I were ever in this type of world. I naturally clean up after people, so why not? Plus, I think it would be a great thing to be able to wipe a human’s memory clean from something they saw that may haunt them forever. Lynlee’s personality just makes Olivia Hardin has done it again! Tangled Up In Trouble is a little bit of both things that a girl loves….magic and romance. I love Lynlee’s character because she is a clean up girl for the MUAC. I think that this would be something that I would do if I were ever in this type of world. I naturally clean up after people, so why not? Plus, I think it would be a great thing to be able to wipe a human’s memory clean from something they saw that may haunt them forever. Lynlee’s personality just makes this book all the easier to read. The romance part is that Lynlee reconnects with a past boyfriend named Beck. When Beck’s daughter needs help that is when he turns to Lynlee. There was never anticipated or expected the romance to occur between them since she was a witch. You will understand what I mean once you figure out what Beck’s feelings are towards witches and any of the magic that they do. I love adventure and this book had that as well. Lynlee is brought to the task of defeating a very dark witch from taking over with a horrid spell. All-in-all the book is a joy to read and I would read it again and again if I could, but there are other Olivia Hardin novels that I have yet to read, and I MUST get to them. I loved her other novel, All For Hope, and so I just knew I was going to be taken on another adventure with Tangled Up In Trouble. I was right, and for that this book gets FIVE STARS. Olivia, you rock! Olivia Hardin has written another delightful and fun book. Tangled Up In Trouble gives you a little bit of magic and a little bit of romance. Lynlee Lincoln is not just a witch shes the clean up gal for the MUAC. That's right when the magical creatures make a mess in front of us humans Lynlee's job is to clean it up , wipe our memories do whatever to make things all better. She has spunky charm that makes for one fun character. Lynlee rekindles a relationship with past human boyfriend Beck. When Olivia Hardin has written another delightful and fun book. Tangled Up In Trouble gives you a little bit of magic and a little bit of romance. Lynlee Lincoln is not just a witch shes the clean up gal for the MUAC. That's right when the magical creatures make a mess in front of us humans Lynlee's job is to clean it up , wipe our memories do whatever to make things all better. She has spunky charm that makes for one fun character. Lynlee rekindles a relationship with past human boyfriend Beck. When his daughter needs help Beck turns to Lynlee and that is where their relationship starts over. The only thing that stands in their way is Beck's feelings about magic and witches. Lynlee takes a job to bring down a dark witch. This witch is collecting ingredients for one heck of a spell (vampire skin, sand man sand lookout magical beings). Lynlee has to defeat her before someone she cares for gets hurt and the witch becomes far to powerful. It all comes together to make one Fun and lighthearted story. I'd say if you are looking for a little romance, magic or just an easy pool side read this one will be for you. Thanks for another great one Olivia Hardin. I devoured the first book in this series and knew I would love this one, as well; it did not disappoint. Lynlee is a witch and also a Neutralizer, meaning she takes care of the messes when supernatural beings interact with humans. An evil witch has just about finished collecting all the ingredients needed to put the final pieces of a dastardly plot in place. The story is funny and original. Lynlee is smart, articulate and fearless. The chemistry between her and Beck is exciting. In spite of busy I devoured the first book in this series and knew I would love this one, as well; it did not disappoint. Lynlee is a witch and also a Neutralizer, meaning she takes care of the messes when supernatural beings interact with humans. An evil witch has just about finished collecting all the ingredients needed to put the final pieces of a dastardly plot in place. The story is funny and original. Lynlee is smart, articulate and fearless. The chemistry between her and Beck is exciting. In spite of busy lives, distance, previous heartbreak, and a pair of adorable urchins, she and Beck want to give love another chance. This book made me smile and believe in magic. Loved it! The Lynlee Lincoln series is amazing !!! I will start by saying that you really need to read them in order. Olivia starts one book where the previous on lets off. They are all short and sweet - and oh so good!!! Once you start reading one, you will want to read it to the end!!! A lot of things happen in the short amount of pages -- but the way Olivia presents it, will keep you on the edge of your seat waiting for more!!! This is the type book that when you finish reading one - you are looking to The Lynlee Lincoln series is amazing !!! I will start by saying that you really need to read them in order. Olivia starts one book where the previous on lets off. They are all short and sweet - and oh so good!!! Once you start reading one, you will want to read it to the end!!! A lot of things happen in the short amount of pages -- but the way Olivia presents it, will keep you on the edge of your seat waiting for more!!! This is the type book that when you finish reading one - you are looking to buy the next one in line. Then, when you get to the last published book, you are going NOOOOOOOOOO - when will the next one be out!!! When Beck's son is kidnapped Lynlee fights to find out what happened and to get him back, Her old mentor seems involved and it is all up to her ti find out what is going on. Will she be on time to s Another good book from Olivia , Lynlee is a witch who also deals with magical creatures and neutralize them. In this second book she is back with her Ex and the try to build a life together with his kids. Lynlee is very insecure about her being the mother figure in this, but she isn't doing a bad job. This is the second book I ready by Olivia Harden. The first story, a novelette, was Trolling for Trouble and I absolutely loved it. You can get the first story free from Amazon right now. Tangled Up in Trouble is just as much fun to read as her first story. I have gotten nothing done at all today because I just cannot put it down. I cannot wait for book 3 and I really hope there is one.